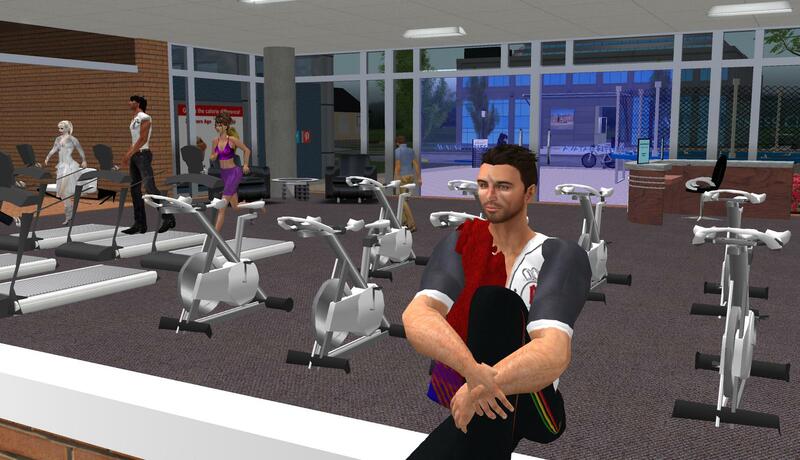 Second Life – Virtual Fitness Centres: What’s it all about? If you’re more concerned about getting involved with this virtual gym as quickly as possible, and don’t really care about this science stuff, then skip down to the third heading. My avatar, Jaye Jeffries, pumping iron. A relatively recent news article in the science media highlights some of the discoveries of a longitudinal study conducted in the virtual environment Second Life, with the goal of delivering a weight loss and exercise program and comparing the differences between a face-to-face approach with a virtual online approach. After looking at the paper it appears promising, though there are certainly some questions that should be addressed about the methodology. First we’ll look at the research, then we’ll delve into an actual virtual gym in Second Life which is freely and publicly available to all. The study split 20 participants, 17 of which were female, into two groups, the face-to-face (FTF) group and the virtual group, and was conducted over a 9 month period with the first 3 months focussing on shorter-term weight loss and the following 6 months focussing on weight maintenance. Results showed that the FTF group had a greater degree of weight loss overall, though the virtual group had a greater degree of weight maintenance. With weight maintenance being an essential factor for long-term weight loss, that probably makes the virtual approach a little more superior even though the FTF group showed slightly higher degrees of weight loss. Let me be honest here, while the study talks about “statistical significance” and differences between the two groups in this regard, there is also the concept of “clinical significance”, meaning that, in the real world – is there really enough of a difference to make it noticable and worthy of use as an intervention? In this regard we might consider the two groups identical in a clinically significant manner, and that’s a good thing! Perhaps the only drawback for this study is that the exercise intervention itself isn’t elaborated on, so I’m left to conclude that it wasn’t very thorough, but taking into account that the research focusses more on nutrition than exercise this can be overlooked with the expectation that future research will focus more on that aspect. In my view, virtual and online environments continue to hold an untapped potential for helping to decrease barriers to exercise, and this study is the tip of the iceberg in many studies to follow that will help to unveil this hidden potential. What’s all this about a gym in SL that you can access? The most interesting part is that you can access Second Life fitness centres yourself, for free, where you can discuss exercise technique with real life professionals, get advice on nutrition and exercise programming, or just socialise and meet new people who are going through a similar experience. What makes this different to a real gym? There’s no cost, it’s far more accessible, and it acts as an introduction for people who might be too nervous or self-conscious to step foot into gym or fitness centre. I stress that there is a real need for translation of this platform into real life, which is what the discussed study begins to explore – the exposure and delivery of weight management techniques and how they translate into real life. There are a number of Second Life fitness centres available, but my favourite by far – and which is actually funded by the United States Department of Agriculture (USDA) based on the above research study out of Kansas University, is the Avatar Fitness Club, hosted and run by the eXtension team. While there aren’t any events planned as yet, though promised to come, be sure to check it out and if you run into Thynka Little, DFox Spitteler, or even myself (Jaye Jeffries), be sure to say hi! If you need more convincing, check out their Facebook page for more info. Jaye Jeffries contemplating the potential for virtual exercise prescription. Have you visited the Avatar Fitness Club in Secondlife, and if so, what did you think? Share your thoughts in the comments!